The Maluridae are a family of small, insectivouous passerine birds endemic to Australia and New Guinea. Commonly known as wrens, they are unrelated to the true wrens of the Northern Hemisphere. 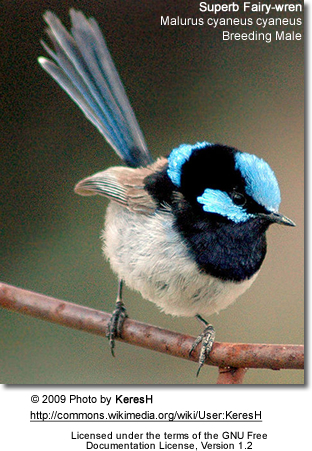 The family includes 14 species of fairy-wren, 3 emu-wrens, and 10 grasswrens. As with many other Australian creatures, and perhaps more than most, the species making up this family were comprehensively misunderstood by early researchers. They were variously classified as Old World flycatchers, Old World warblers, and Old World babblers. In the late 1960s morphological studies began to suggest that the Australo-Papuan fairy-wrens, the grasswrens, emu-wrens and two monotypic (one single species) wren-like genera from New Guinea were related and, following Charles Sibley's pioneering work on egg-white proteins in the mid-1970s, Australian researchers introduced the family name Maluridae in 1975. With further morphological work and the great strides made in DNA analysis towards the end of the 20th century, their position became clear: the Maluridae are one of the many families to have emerged from the great corvid radiation in Australasia. 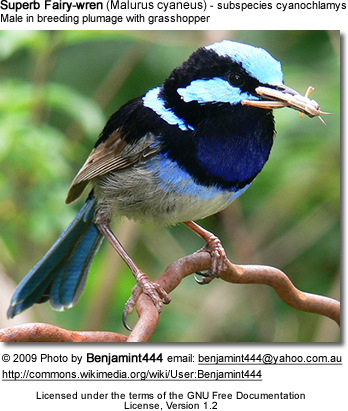 Their closest relatives are the Meliphagidae (honeyeaters), the Pardalotidae, and the Petroicidae (Australian robins). Their obvious similarity to the wrens of Europe and America is not genetic, but simply the consequence of convergent evolution between more-or-less unrelated species that share the same ecological niche. 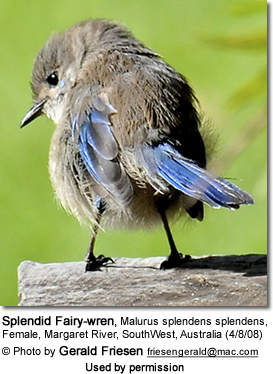 Fairy-wrens are notable for several peculiar behavioral characteristics. They are socially monogamous and sexually promiscuous, meaning that although they form pairs between one male and one female, each partner will mate with other individuals and even assist in raising the young from such pairings. Males of several species pluck petals of conspicuous colors and display them to females for reasons unknown. 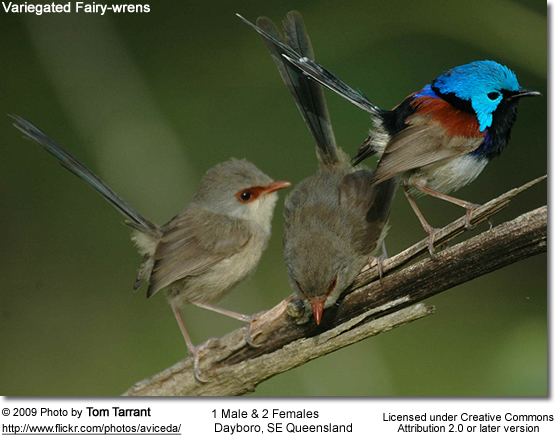 The song of fairy-wrens is pleasant and complex, and at least two species (Superb and Splendid) possess, in addition to the alarm calls common to - and universally understood by - most small birds, another vocalization used when confronted by predators. This, termed "Type II Vocalization", is song-like and used when confronted by calling butcherbirds and sometimes other predatory birds, but its purpose is unknown; it is certainly not a warning call.